Oh, dear. Bye. I hope you make it back!!!!!! you and your mom are cute. :) I'm gonna go check out the article. Congratulations on being crowned the "Citrus Queen" I'm sure you aced the talent competition, but were there swimsuit and evening gown competitions too? I'm imagining you sewing your own gown out of your fabric! I'm back. The sky-diving didn't work out, since the instructor took one look at my homemade parachute and made me go home. "Cute, but not functional," was the verdict. Charlene, there was some stiff competition for the title, but I clinched it in the interview portion. As my platform, if crowned the Citrus Queen, I vowed to make sure that all U.S. Americans have maps. Orange ones. Cool, and have fun sky-diving! 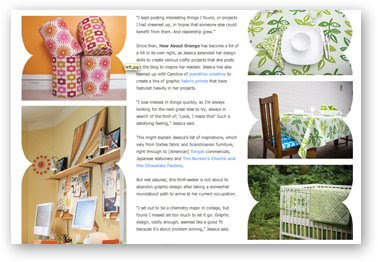 PS loved how the photos of your products flanked the article! great interview, I like your office decoration! I'm a subscriber to Living Creatively, I just smiled when I saw the interview. Great read and love the pics. you are a funny gal. not sure I like you. Ooh -- I love Living Creatively. What a nice interview! Good luck with your dive. Great article! I love your office. My iMac needs a new desk and I just love your tables! Do you mind sharing where they are from? They're mismatched. One is our old little dining room table from a furniture store I forgot the name of long ago, and the other is from Ikea. The sort where you choose the legs and then choose a top. And that one came unfinished, so I varnished it. Jessica, I really love your work. You've got such a great, fearless eye! Really enjoy your blog, too. I'm getting married in August and my bridesmaid's dresses are orange. Love it!